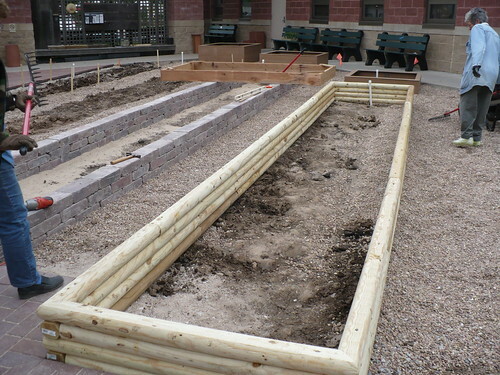 Garden Renovation: Days 26-28 – Building Raised Beds & FINAL Drainage! We are making progress! With any luck, we should have the last 2 raised beds built and everything ready for soil by next Tuesday. 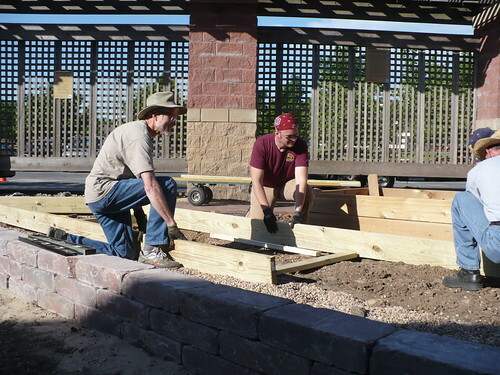 Last Friday we built a raised bed out of landscape timbers and placed two beds made of red cedar. One of the Master Gardeners had pre-built them in his garage. 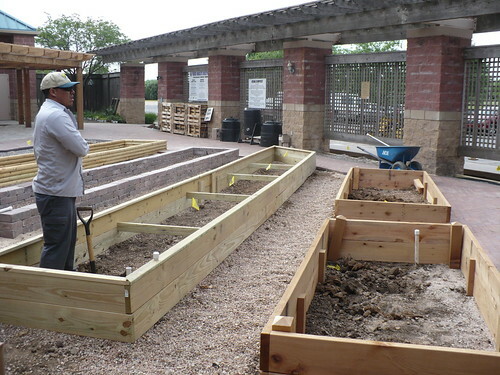 This week, the Master Gardeners came back and built the treated lumber raised bed. That means all we have left is the grape bed and the recycled plastic lumber/decking lumber raised bed to complete. 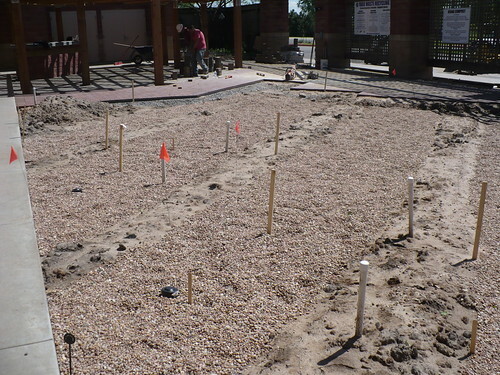 Today, the drainage & irrigation contractor is back to finish their part of the job, which includes digging drainage holes at regular spaces in the beds and filling them with gravel, then covering them with filter fabric. They will also get the ball valves for our drip lines installed. The landscape timber bed was a little bit of a challenge, because the timbers are cheap, and can sometimes be a little bit warped. So we had that to deal with, in addition to the usual project of keeping the beds level. It got easier once more of the timbers were in place. We are using long screws to hold the entire thing together. Here’s a look at the finished bed. We’ll have to go back and do a bit more leveling in the middle once we have the soil to fill the beds. With that bed done we got the two smaller cedar beds in place. We still have to get the decorative corner braces in place, but they are still being painted. 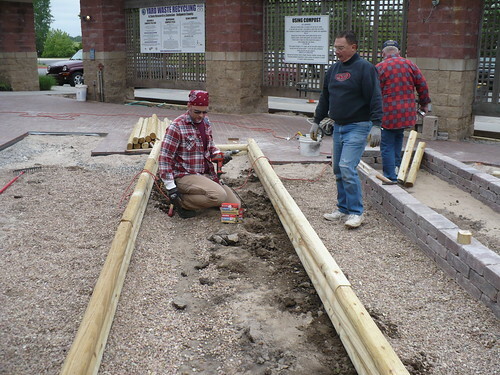 Yesterday (Wednesday) the Master Gardeners got the treated lumber bed built. 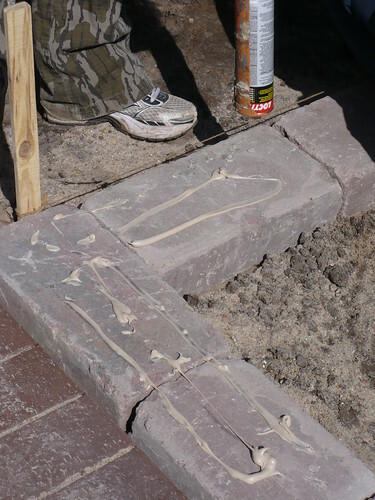 Same routine as before…level the dirt, get the initial boards in place, level some more, and finish! Here you can see the finished treated lumber bed. 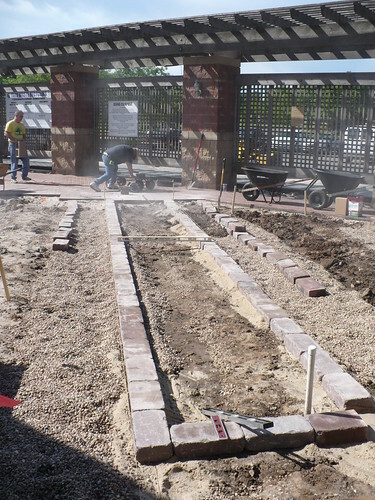 It is a little hard to see, but we decided to make the end of the bed angled to follow the pavers rather than straight. I’m still not sure quite what I think of that, but I’m sure it will be fine. Each of those yellow flags is going to be one of the drainage holes in the bottom of the beds. 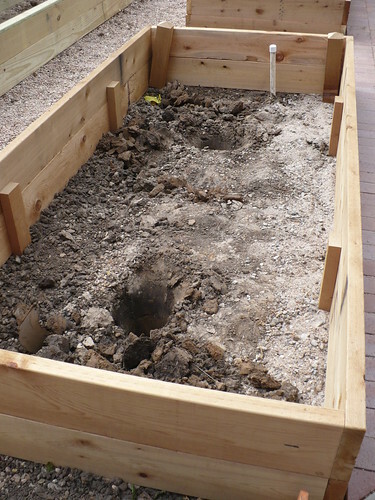 Here you can see the two drainage holes dug in one of the smaller, red cedar beds. 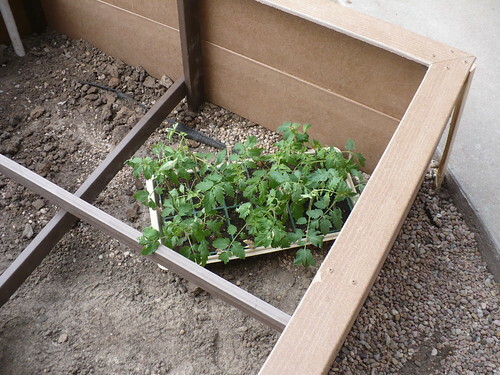 Just to be clear…this is not something that the average person would have to do when building a raised bed. We are putting the additional drainage in the bottom of the beds because we are on a compacted clay construction pad. The drain holes are supposed to be dug through to the sandier, natural soil underneath the compacted clay, just to make sure we’ve got sufficient drainage. With all this drainage, I hope we’ll be able to keep the beds well watered! I’ll show a few more pictures of the finished drains tomorrow or Monday. With the gardening season well underway, thanks to the early, warm spring, I think lots of Kansas gardeners are trying their best to make sure that they have a great garden this year, after the dismal year we had last year. As you are getting your garden started, I would encourage you to take extra care in choosing what you apply to your garden. Many of the products that we routinely use for flowers and other ornamentals are not safe to use on your vegetable garden! It is very tempting to grab that bag of fertilizer or bottle of pesticide that you bought for your lawn or trees or flowers and use it on your vegetable garden. Sometimes, that is okay. Other times, it can be a BIG problem. 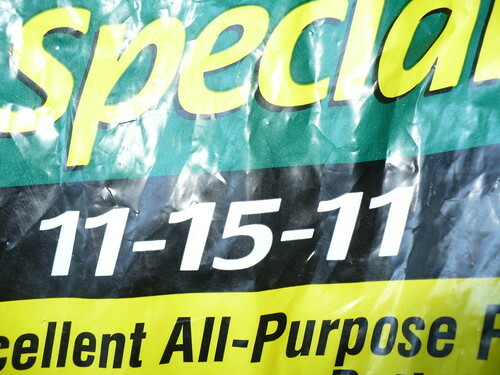 Before you apply any product – fertilizer, herbicide, insecticide, fungicide – read the label! It should clearly state that it is safe to use on vegetables. If you are in doubt at all, go buy a product that is specifically for vegetable gardens. I can’t emphasize enough….READ THE LABEL BEFORE USING ANYTHING!!! Fertilizers are usually not a problem, as long as they are not combined with another product. The biggest mistake people make is using a “Weed & Feed” product they bought for their lawn. Yes, you might want to prevent weeds in your vegetable garden, but the particular herbicides in those Weed & Feed products are designed to kill plants like your vegetables. Some of those herbicides will persist in the soil and cause problems for your vegetables for 6-12 months! Insecticides and fungicides are another issue. Herbicides prevent plants from growing, so you are unlikely to even get a crop. With insecticides and fungicides, a product that is not specifically labeled for use on vegetables may not be safe to use. Those residues may be in or on the plant, causing unknown harm. While unlikely that you would immediately get sick from eating a tomato with a chemical residue not intended for consumption, it is not a good idea to take a risk on pesticides that have not been labeled for use on a food crop or that are at a higher concentration than is labeled for safe use on food crops. You want to consider both short-term and long-term health in those cases, especially if you have young children or elderly in your family. I personally would avoid consuming produce from a garden that has been treated with a product that is not labeled for edibles. I don’t think it is worth the risk. Yeah, we aren’t jumping straight from building the raised beds to planting tomatoes in one day. Sorry, we aren’t that good! However, down inside one of those raised beds is a great place to put some tomatoes that are ready to be hardened off, especially on a cool, blustery, April morning! We actually have raised beds! Well…some of them. No soil yet, but it feels like we’re making progress. 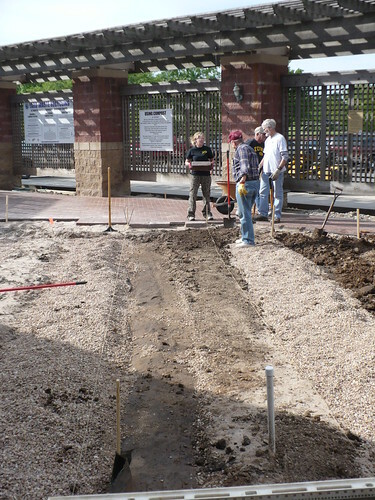 The first thing we did this morning was to run string lines and then rake the gravel and remaining mounds of dirt into the right areas so that the beds would be level. 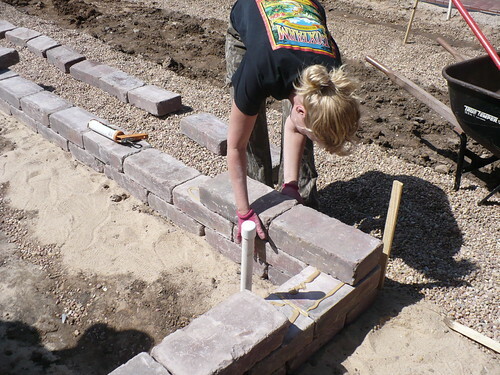 Once it was close to level, we were ready to start laying the block. Fitting the first layer of block was the biggest challenge to get everything as level as possible. 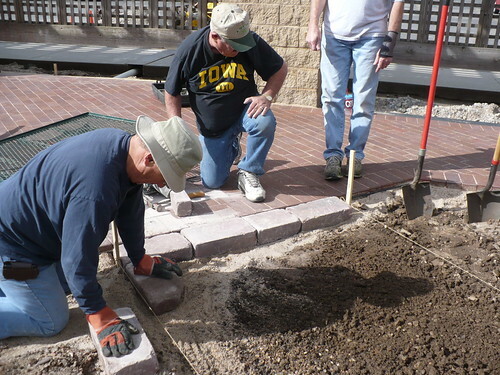 The Master Gardeners did some hard work with the level to get those blocks to lay just right. After that hard work, it was time for a snack break. 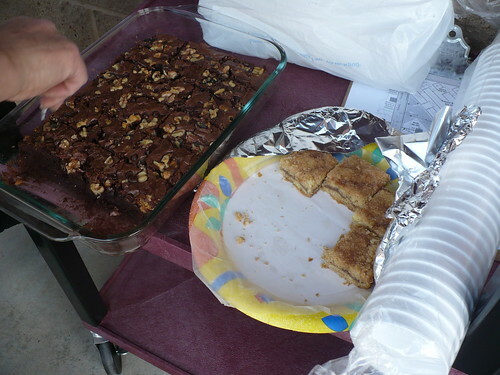 Brownies…the fuel of every Master Gardener activity! 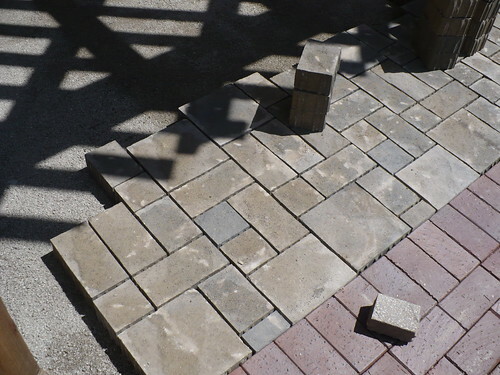 We used an adhesive to help hold the blocks in place. The second layer went much faster than the first layer! In no time at all, we were ready for the third layer. 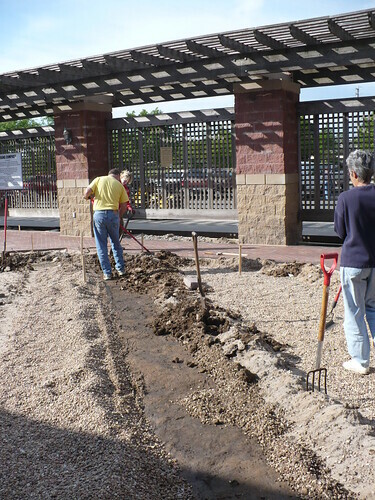 By the time we have all the mulch in place in the pathways, the bottom layer of block will be mostly covered. 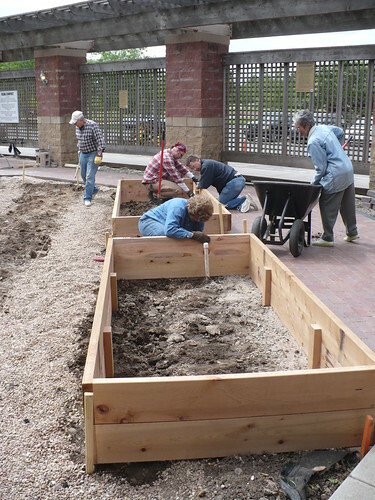 In the mean time, a small group worked on getting those square raised beds leveled. 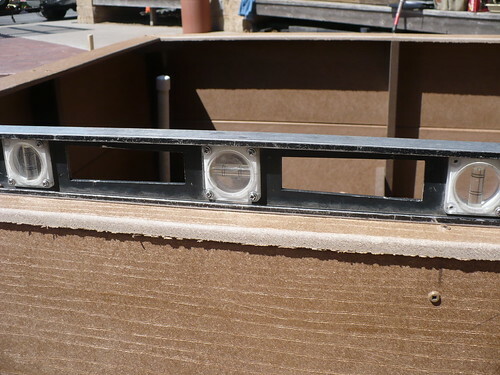 These raised beds were made out of a cheaper recycle plastic lumber that is only 15/16″ thick. Because of that, they had to have more support beams inside, and even then some of the boards are already bowing slightly. We’ll probably put a little more support on the inside to make them sturdier. Woohoo! That’s one of the big raised beds finished and the three small ones finished and in place. Only 6 more to go! We’re planning to get 2 more smaller beds and a large bed installed on Friday. Also, the Compost committee is planning to start building their compost bins on Friday. That would just leave 2 more large beds and a small triangular bed to complete next week. It is hard to believe, but I think we are actually seeing the light at the end of the tunnel with the contractors’ portion of the construction. All that is remaining is part of the permeable pavers in the classroom area. 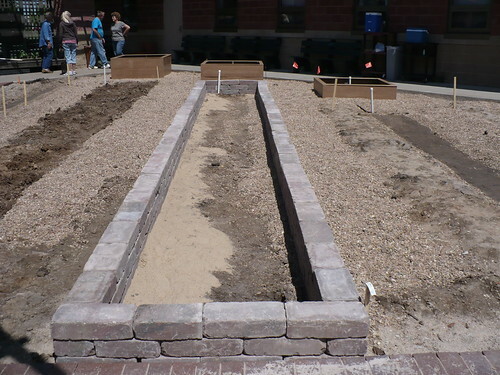 Then we have a lot of work to do building raised beds, filling them with soil, and getting mulch in between the beds. They finished laying the brick the end of last week. Doesn’t it look great? 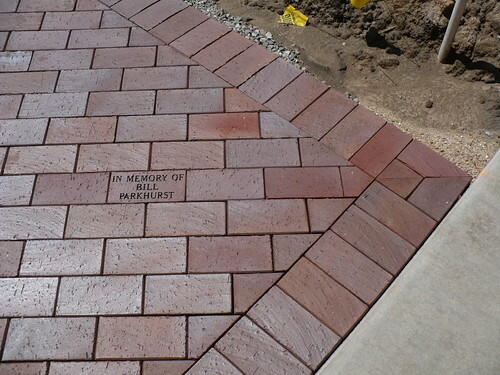 You can see one of the commemorative bricks here. 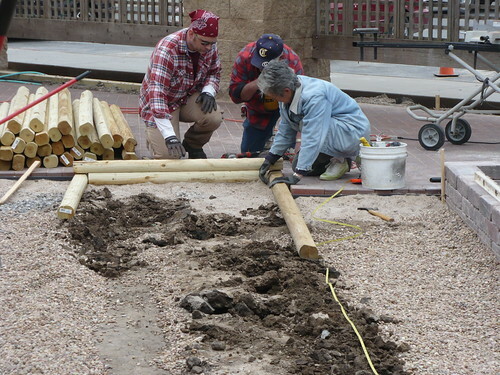 If you look hard, you can see all the packed base material there for laying the permeable pavers. 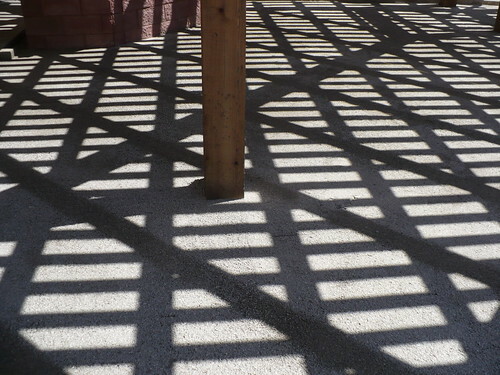 I was more interested in the cool shadow pattern when I took the picture! It may not look like much yet, but we marked out the locations for the raised beds yesterday, and we are planning to start construction tomorrow! I’ll try to have pictures to post on either Thursday or Friday.